Is there one national waiting list? No. The nation is divided into 58 organ procurement organizations (OPOs). Transplant allocation systems distribute organs largely to transplant programs in the same area of the country where the organs are procured. The organ will first be made available locally, within the OPO. Thus, patients at the transplant centers within OPO will have priority over those who are registered at the centers outside the OPO. Statistically, about 80% of organs procured within an area of OPO coverage are placed within the OPO and only 20% are transplanted outside of OPO, so the system can be viewed as 58 independent lists in 80% of the time. Why highly sensitized (high PRA) patients wait longer and how to go around it? Panel Reactive Antibody (PRA) percent estimates the percentage of donors that a person is biologically compatible with. In order for a patient to be compatible with a donor, they have to be of the same blood type or compatible ones and the HLA crossmatch should be negative. If your PRA is 80%, you are only able to accept 20 of 100 donor offers. What can be done? Strategy 1: Register at transplant center with high volume of cadaveric transplants. If a patient with 80% PRA lists at a transplant center that receives only 20 cadaveric kidneys annually, they get only 2 chances a year that a kidney might be offered: Out of 20 kidneys, half might not match the potential reciepient blood type; leaving just 10, out of those, only 2 might match due to the PRA=80%. If, instead, a candidate lists at a center that gets 120+ cadaveric donors, the chances increase to 12 potential kidney offers a year. Unfortunately, about a quarter of transplant centers in US receive only 25 or less cadaveric kidney in US annually; while another quarter receives only about 50 annually, thus the high PRA patients in those low-volume centers wait very long. The Reduce Wait Time tool has functionality to filter out the transplant centers by volume to determine where the high PRA% folks should be listed to get better chances at transplant. National Kidney Registry has had a stable donor pool of 300+ donors for the last several years. Their matching potential is disclosed in the quarterly report and on average it takes just few months to get transplanted through NKR for a patient with PRA<80%. The 300 donor pool can be viewed as equivalent of being on top of the 3 cadaveric waiting lists with the volume of over 100 transplants each annually. While majority transplant centers desensitize patients with living donors only, few centers in US are experienced in desensitization of patients on the deceased donor list with absence of the potential living donor: Indiana University, Mount Sinai Hospital in New York City, University of Wisconsin-Madison and University of Washington-Seattle. In addition, a New Jersey medical company, Biologic Tx provides desensitization as an outpatient procedure with no living donor required as well. Why am I required to send my PRA kit every month? Monthly blood sample is required to perform crossmatch, ie match your blood with the potential donor blood and see if there is compatibility. Am I on the top of the list? How are donor kidneys get distributed among the candidates on the list at the transplant center? The transplant center requires all patients send their monthly blood sample (PRA kit) in, allowing them to run crossmatches for all patients. 1 First see if anybody (no matter where they are on the list) matches perfectly (6 out of 6) to a kidney offer. If yes, the kidney offer goes to that patient. If no, proceed to step 2. 2 Run crossmatches against the kidney offer for the top 20%-30% that have been on the list the longest time. See how many of those 20%-30% people matched and how well, ie assign the match quality points for each candidate that matched. 3 If none from the top of the list matched, see if anybody at all on the list matches. 4 If nobody got a kidney offer from step 3, send kidney to regional. Literature indicates that 80% of the kidneys stay transplanted locally, so Step 4. is used only in 20% of the cases. With this approach, the top 20%-30% of patients who were on the waiting list the longest get priority over the rest of the list. It is still possible to get a kidney offer for the lower 70%-80% of patients if the top 20%-30% did not match or get a perfect match. Only top 20%-30% who waited the longest are required to send their PRA kits in for crossmatch and considered against the potential donor. Patients who waited the longest and the transplant center professionals think there is a chance for those people to get transplanted within this year, are being asked to send their monthly PRA kits in. All other patients on the list have no chances to get a transplant since no monthly blood sample is required from them. Only after several years on the list they go high enough on the list to get a call from coordinator that would ask them to start sending their monthly PRA kits in. This approach is mostly used in centers with thousands of candidates on the waiting list such as at USCF, University of Maryland and others. Regardless of the approach, the waiting time is the dominating factor. The 20%-30% top of the list who waited the longest are the contenders and most likely the recipients of the new kidney. How does the longevity of living kidney transplants compare to the cadaveric donor transplants? 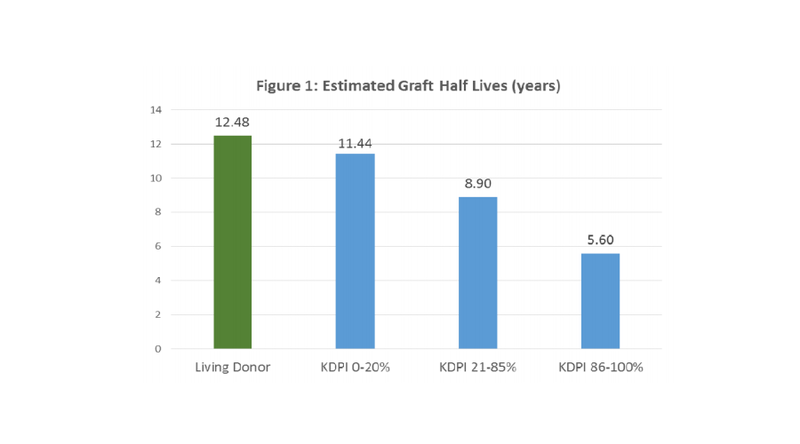 OPTN data indicates that on average, good quality (KDPI<20%) are similar to the living donor kidneys; while medium quality cadaveric kidneys are about 28% inferior to living donor kidneys. Are certain blood types more difficult to match for a transplant? Yes, patients of blood type O and B usually wait the longest. The approximate distribution of blood types among american population is the following: O-45%, A-40%, B-11%, AB - 4%. AB is a universal recipient and can receive from anybody. Blood type O is hard to match because it only can receive from O, so there is really a separate queue for patients with blood type O at each transplant center. In addition, it is estimated that O recipients received only about 85% of all O donor kidneys. This happens because either they did not match blood type O candidates on the list or others with blood type A,B,AB had a better match. There are a lot of patients with O blood type competing for the O type organs, it is the most common blood type. Some transplant centers, such as the University of Kansas Hospital have most of their patients of blood type O; the Miami Transplant Institute that has high attrition rate or O blood type patients and thus 5 year wait for O blood type, while only 3 year wait for blood type A. Blood type B is hard to match because its a rare blood type. While B can receive from O and B, the pool of kidney offers for B recipients is limited by just small percentage of people with B blood type donors, that are only 11% of population; plus the small percentage of O donors that spilled out from O queue because were not compatible to O. To circumvent this, B should also list in high volume centers. Blood type A is easier to match because in addition of fairly large percentage of potential donors with blood type A, some of the O will also match A. Blood type AB is the easiest. University of Maryland Transplant Center reports to transplant their AB patients in 3 months. Even if an AB on the bottom of the list at the transplant center, he/she will be transplanted because he could be the only one who matched the donor offer. What do the kidney transplant outcomes presented by the transplant center depend on? The kidney transplant outcomes depend on recipient pool at the center, number of transplants performed annually and complexity of the transplants. Thus, the transplant outcomes might be somewhat subjective and might not be crucial factor in choosing a transplant center. If your insurance is contracted with the transplant center (ie you have chosen an in-network provider), the insurance will pay your transplant center about 90,000$ for transplant surgery and hospital stay. Out-of-network centers will charge higher price, however most transplants are done by in-network centers. Your co-pay varies depending on your insurance plan. It could be just 250$ or as high as 20,000$ ( 20% of the total cost ) and usually is picked up by secondary health insurance. If you are a foreigner, the price for your kidney transplant surgery is set by transplant centers individually. A transplant center shared with me that their transplant surgery bill for a foreigner was over 500,000$. Can a foreigner receive a kidney transplant in US? Most US transplant centers don't transplant foreigners, however University of Toledo Medical Center has done transplant surgeries between foreigners and US citizens . Both parties brought their own living donors. Mayo Clinic in Rochester, Minnesota has similar program. While Illinois is the only state to cover costs of kidney transplants for the undocumented immigrants , many fear that the program might get shutdown due to the lack of funding. How many hospitals can I list at for a kidney transplant? Theoretically, you can list at 58 different transplant centers. Practically, there are about 20 transplant centers in the country that have less then 2 year wait. Some will not be covered by your insurance, some will be too far geographically, some will not return your phone calls/e-mails, some will take too long to evaluate you: that will narrow your search down to 4-5 centers. Over 100 transplant centers (half of all transplant centers in US) have waiting period over 4 years and it is impractical to register there. The official UNOS policy states "You probably would not benefit from listing at multiple centers in the same local allocation area. This is because waiting time priority is first calculated among candidates at all hospitals within the local donation area, not for each hospital individually." The policy implementation imposed a large amount of discretion by transplant centers. Most transplant centers will not list you if are you already registered in a hospital within an OPO. For example, John Hopkins will ask you if you are listed at University of Maryland, Georgetown will not list you if you are already at Inova, you would have to choose between Tampa General and Lee Memorial. Yet, there are few transplant centers that will encourage listing even within OPO. As social worker at Iowa Methodist Transplant center points out, "We have people listed at both Mercy Medical Center in Des Moines, The University of Iowa and Iowa Methodist Medical Center. Different surgeons have different criteria for the organs they accept. Some surgeons are willing to have kidneys brought in, biopsy them, put them on pumps and check to see if they will work well of their patients before transplant. We absolutely encourage multiple listing within our OPO and we have seen it make a difference." My transplant center denied putting me on the list because i am underweight (or overweight). Any suggestions? Go to a different kidney transplant center. Transplant centers have different acceptance criteria and whats a "No" in one center is a resounding "Yes" in another. Am I too old for a kidney transplant? What is the age limit for a kidney transplant? Each transplant centers has different age acceptance criteria and you would have to enquire individually with each center.